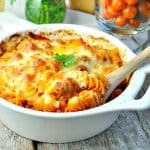 This ground beef casserole couldn't be easier to make and is sure to please the whole family. 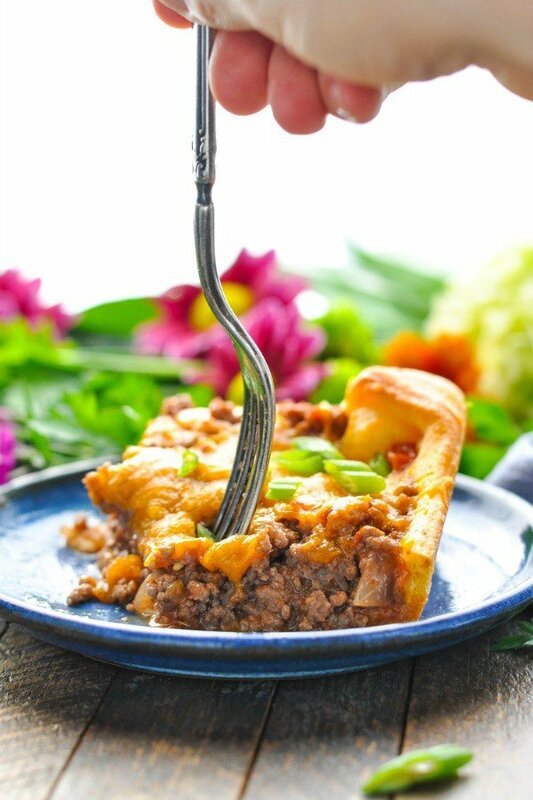 This 4-Ingredient Crescent Roll Ground Beef Casserole comes together in just minutes for an easy weeknight dinner! It’s a simple one dish meal that you will turn to again and again when you need to feed your family…fast! Along with chicken breasts, ground beef is one of those staples that makes its way onto our meal plan just about every week. 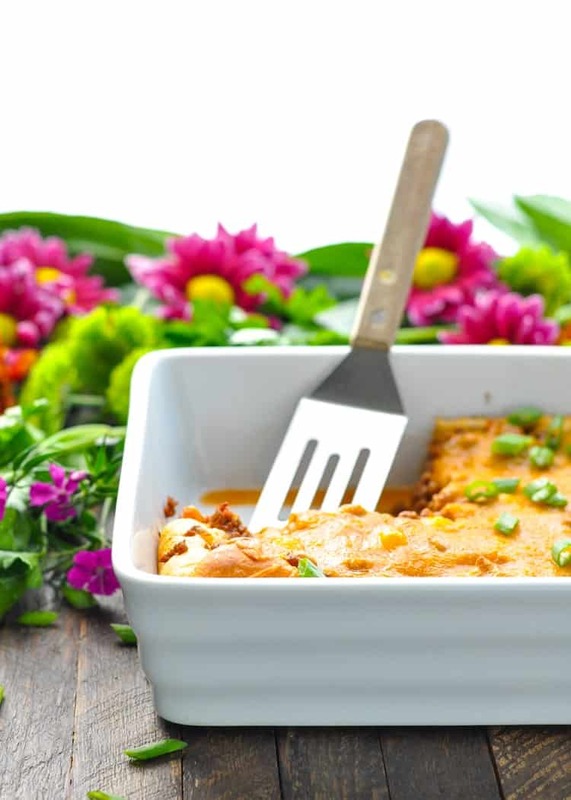 It’s easy to buy the meat in bulk and then save it in the freezer for nights when you don’t want to make a separate trip to the store, and the versatile protein works in so many different types of recipes. 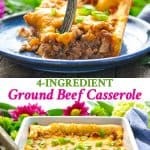 Since I’m always looking for new ways to keep dinnertime interesting, you can imagine how happy I was when a reader named Stephanie shared this ground beef casserole recipe with me! One look at the list of ingredients and I instantly knew that it would be a winner in my house, too! 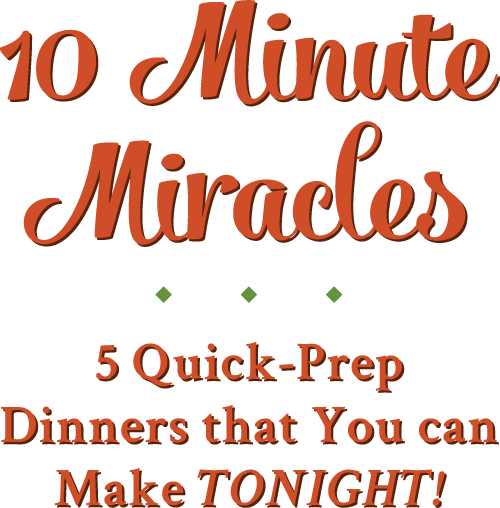 One of our favorite “quick” dinners is one that we had when both our children were growing up, and now my husband and I still enjoy it! The bonus now is that there are more pieces leftover for lunch the next day! 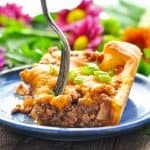 Although I called this recipe a Ground Beef Casserole, it’s also a lot like a Taco Pizza (as Stephanie said). 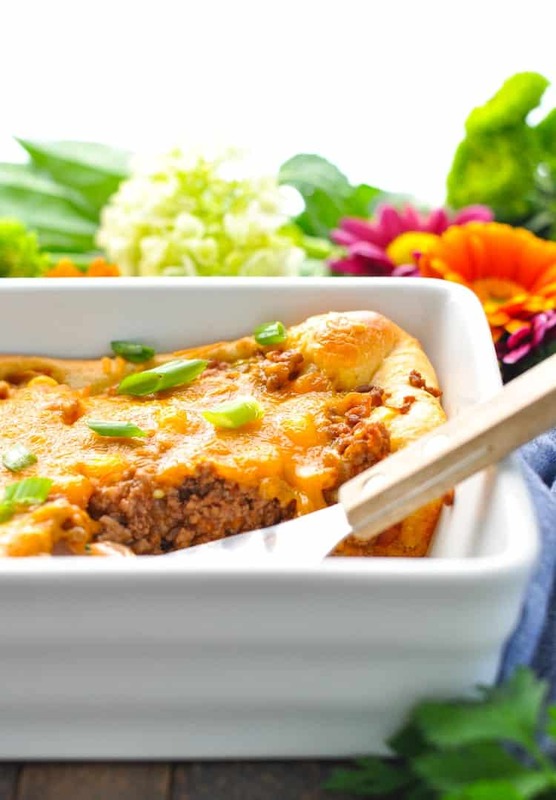 The crescent rolls form the crust, which is filled with salsa (or barbecue sauce), ground beef, and cheese. Who knew that 4 simple ingredients could taste so darn good!? 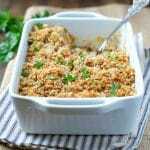 In fact, the first time I served this ground beef casserole, Keith spent the entire meal raving about it. No, I didn’t tell him just how easy it was (I’ll let him think that I spent a long day slaving over a hot stove)! The dish is now on my go-to list of “quick dinners” as well — thanks to the tip from Stephanie! Spray an 11 x 7-inch baking dish with cooking spray. You can also use a 9 x 13-inch dish -- it will just yield a slightly thinner crust and beef layer. Either works well, though! Unroll crescent roll dough and press into the bottom of the prepared dish to form a crust. Set aside. In a large skillet, cook ground beef over medium-high heat until no longer pink. Drain any fat from the skillet. Stir in 1 cup of salsa. Spoon beef mixture over the crescent roll dough. Sprinkle with grated cheese. Bake for 20 minutes, or until crust is golden brown. Cut into squares and serve. Thanks, Gayle! Yep — easy dishes like this were made for me, too! SO good! 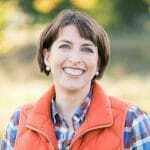 I have tried so many of your recipes from your blog and have loved every single one of them. Thank you so much for sharing and God bless. By the way, I live in Richmond Virginia and envy that you live in the mountains. The Blue Ridge Mountains are so beautiful and I make it up there every year for my birthday. Luckily, my birthday is in October so I get to hit the mountains at the perfect time. I do love the mountains, but I also think Richmond is a really great little city. I used to spend quite a bit of time there when I was working as a lawyer, and you can’t beat the Jefferson Hotel! The kids and I also love the Lewis Ginter Botanical Gardens. It’s such an easy city to navigate and get around, which I appreciate — not too overwhelming! Thanks so much for reading the blog and for saying, “hi!” Enjoy the holidays! 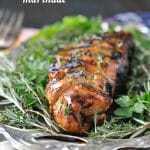 I just tried this recipe wth the bbq sauce variation, & let me tell you what!!! It was absolutely amazing, my husband loved it!! Thank you!! I’ve made a similar dish for the past few years except I’ll pour about a cup and a half of mexican white cheese dip over the top and then put another layer of crescent rolls on top. I’ll sprinkle taco seasoning on the top and bake in the oven for 20-30 minutes until the rolls are done. Yum! Your version sounds delicious, too! Thanks, Cass! 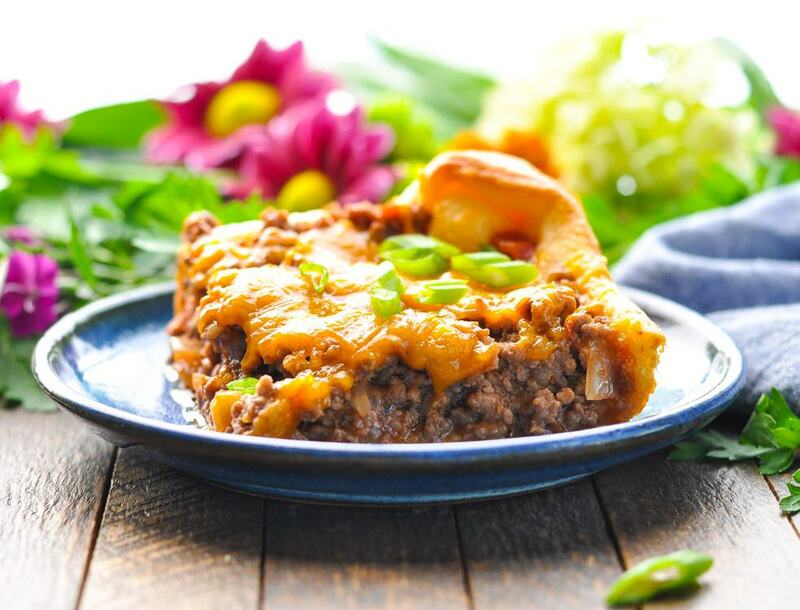 Savory barbecue sauce mixed with ground beef and topped with a buttery crescent roll crust is sure to impress your family and guests. With just a handful of ingredients, what’s not to love? Hi, what can I use in England to substitute crescent rolls please? I’m in the UK… Read recently that “crescent roll dough” is essentially croissant dough, and sold in tubes in Tesco freezer aisles. OH!!!! Yes, I didn’t realize that you can purchase croissant dough in the UK. That’s definitely what you would want to use, since crescent rolls are basically just little croissants! Thanks for that tip, Alice! Do I need to bake the bottom croissant till it’s half baked and then add the hamburger mixture so that it’s not soggy? Hi, David! No, I have never pre-baked the crust. It’s not going to be a crispy crust like you would find on a brick-oven pizza, but I never found it to be soggy. You could certainly pre-bake it if you want to try it that way, though. If the edges start to get too brown when it’s in the oven for the second time, just lightly cover the edges with foil (like you would do with a pie crust). Hope that helps! how do you adjust this for chicken breast? Hi, Sam! You can use ground chicken breast in exactly the same way that the recipe calls for ground beef. It’s an equal swap. If you want to replace the beef with cooked, diced chicken breast, you will need about 1 1/2 – 2 cups of the cooked chicken. All other instructions remain the same. Enjoy! Tasted great and indeed simple to make. I added seasoned black beans which worked well. I made this recipe last night. It was super easy and delicious. I always know if it was liked when my picky eater significant other takes three helpings. The only thing I changed was I put a layer of the crescent rolls on top as well. 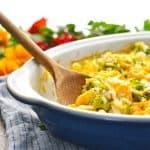 Thanks sharing recipes that are quick, easy, AND delicious! Do you think it is too spicy for a toddler if the salsa is used? Great! Thanks so much, Alicia! Want to try this tonight. Can I subsitute with biscuits and thin them some like crossiant rolls?